Okay, Christina... I have to share my "grunge" card that I made several weeks ago. It was great fun and takes cardmaking to a whole new level! Of course, it's not all flowery and beautiful like your cards, but I think it turned out really neat! Grunge is all the fashion at present and it makes a really good look for cards....and particularly male themed ones. No flowers you see!! With Grunge you can add all sorts of things, cog wheels, string, bits of wire and how about some cog wheels from an old watch. 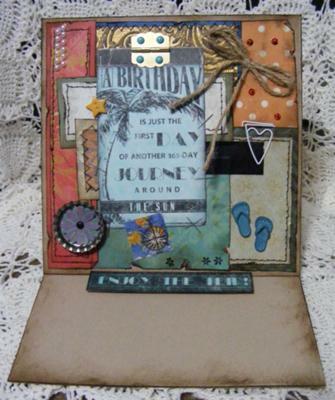 Tim Holtz does a fabulous range of items that can all be added to this look. 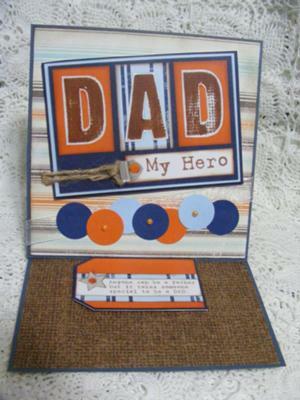 Items that include keys and locks, metal tops and his Distress Inks can all be used to perfection on this style of card. I love the use of the hinge on this one, makes you wonder what is under the flap. I just wanted to share with you the bouquet I made for my granddaughter to give to her mother (my daughter) for Mother's Day! I used a 1-3/8" round punch to make the five petals on the flower. I used scraps of scrapbook paper in assorted colors and patterns. I purchased two bunches of silk roses (eight flowers on each bunch) at a local craft store, carefully removed the silk roses, and glued on my paper roses. Then I filled the vase with clear flat stones to hide the stems, and tied a bow on the outside of the vase. The result was awesome! 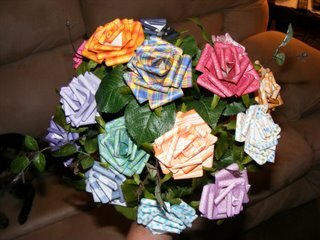 Give the paper roses a try - they are so much fun to make, I followed Christina's paper roses tutorial, and she makes everything look so easy! 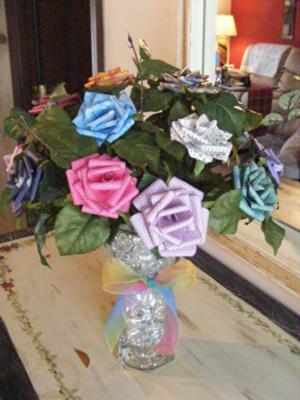 The paper roses have caused such a stir on the website and they are really gorgeous once you have done them. These are fabulous Leslie and you must be really proud of them. The only problem is they are addicitve and you will end up with roses everywhere. The instructions for the flowers are in the Video Tutorials in the NavbBar to your left. And once you have got the hang of them, then why not try Enamelling them too. That is also in the Tutorials, but take care as the embossing powder gets really hot. 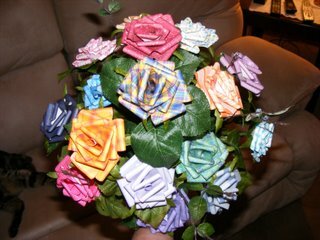 I'm so excited for everyone to see the paper roses bouquet I have made! These are three more pictures of the bouquet, that I took right after I got finished gluing the roses to the stems. These show the colors more vividly. I have several cards that I'd like to put on there too, probably this week! Thanks again!! 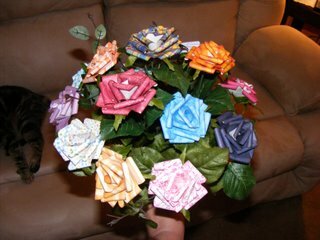 These Paper Roses are just wonderful and so easy to make. You can alter the size to suit your project quite easily as Leslie has done. She has made hers really large and added them to a vase. The colours and patterns on these make them suitable for any room and they will last a lot longer than the real thing....and be a lot cheaper too. 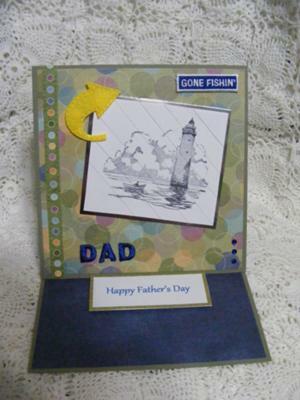 I'm pleased to share several Father's Day cards I've made. These cards were made using Christina's easel card idea. I'm so hooked on these easel cards - I probably won't ever make another "regular" card again!! 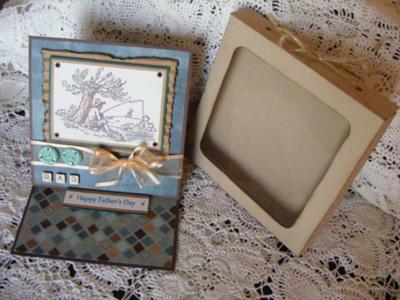 These were really fun to make and definitely have that masculine flare for Father's Day. Thanks again, Christina, for your awesome tutorial!! Fathers Day is just as popular as the day for your mum, but often making a male card leaves us flat. They are notoriously hard to make because of the lack of "Bling" But altering the style of the card can make it interesting. And alhough these are kept very masculine they are just what your dad will love. Keep the colours more bold and add something that your dad likes or does as a hobby. The back of the card is where you can add your special message, and if the card has no dimension to it then it will fit into a standard envelope. 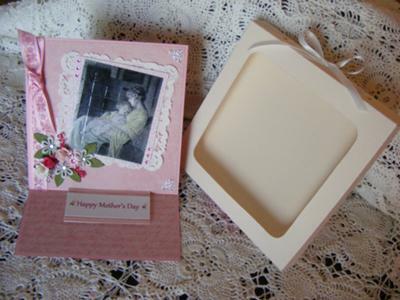 But if you have added embellishments that give the card some height then you will need to make a box. In Papercrafts you will find instructions to make the Special Card Boxes to send your cards in. 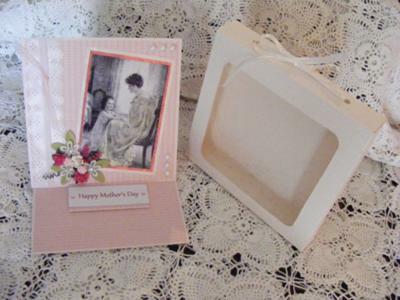 I made several Mother's Day cards using Christina's easel card idea. They were so much fun to make and really were a hit! I also made matching card boxes - also following Christina's instruction! I'm very pleased to share these with you! They turned out so beautiful - thank you for the tutorial, Christina!! The Easel card is right on trend in the card making arena and it is such an effective card to make. The "Newbie" to this lovely hobby would have no trouble producing a stunning effect to wow the recipient. The card can be kept flat and so go into a standard size envelope but if you want to add dimension to yours, as Leslie has done, then you will need to make a box to send it in. You will find the instructions to make these boxes, and others in Papercrafts which is in the NavBar to your laft. 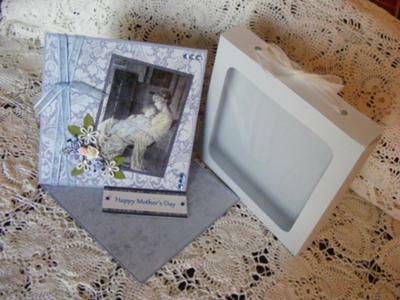 There are Special Card Boxes ...Wedge Boxes...Pillow Boxes all easy to make for your projects.